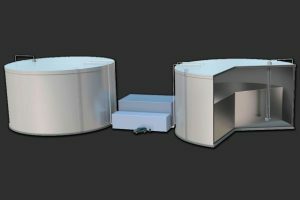 MIT engineers have designed a conceptual solar and wind power storage system that delivers energy back into an electric grid on demand. According to the researchers led by professor Asegun Henry, the system is designed to power a small city not just when the sun is up or the wind is high, but around the clock. It is estimated that such a system costs about half as much as pumped hydroelectric storage, which remains the cheapest form of grid-scale energy storage to date. The new storage system stems from a project dealing with concentrated solar power. Called Thermal Energy Grid Storage-Multi-Junction Photovoltaics (TEGS-MPV), the system converts electricity generated by any renewable source, such as sunlight or wind, into thermal energy via joule heating. Joule heating is a process where an electric current passes through a heating element. The new system consists of a large, heavily insulated, 10-meter-wide tank made from graphite and filled with liquid silicon, and is kept at a cold temperature of almost 3,500 degrees Fahrenheit. A bank of tubes, exposed to heating elements, then connects this cold tank to a second hot tank. Simultaneously, liquid silicon is pumped out of the cold tank and further heats up as it passes through the bank of tubes exposed to the heating elements. It then moves on into the hot tank where the thermal energy is now stored at a much higher temperature of about 4,300 F.
When electricity is needed, the hot liquid silicon – so hot that it’s glowing white – is pumped through an array of tubes that emit that light. Specialized solar cells, known as multijunction photovoltaics, then turn that light into electricity, which can be supplied to the town’s grid. Once cooled, the silicon is pumped back into the cold tank until the next round of storage – making it act effectively as a large rechargeable battery.